Well, today I am presenting you Lords Mobile: Battle of the empires published by IGG games. And I want to say that for me this is one good game and now I will tell you why. Lords Mobile is a game that ended up surprising me. We all know the saying about judging a book by its cover. Well, I’m adding to that: never judge a game by its tutorial. For whatever reason, the developer stocked the opening of the game with the players repetitiously digging through menus. There were a few moments where I got to watch a battle unfold, but they all played out on their own with no direct involvement required from me. Once those battle segments ended, it was right back to open a menu, hitting “upgrade,” closing the menu, and utilizing the free instant upgradeability to finish off the timer for that particular upgrade. The game directed me from menu to menu, upgrading so many buildings that I stopped paying attention to the specifics and just went straight for the “upgrade” button and then the “free” button to finish off the upgrade. This sort of chore is typical (though to a lesser degree) in many mobile strategy games, but Lords Mobile has taken it to an extreme. Now let`s talk more about this game and see what we have here. If you were paying attention during the large-scale fight sequences at the beginning of the game, you’ll have noticed that hero units lead the armies. 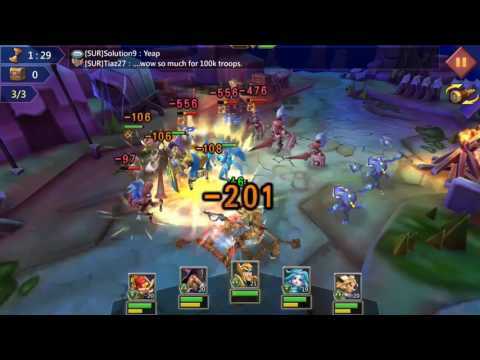 Players can not only collect heroes, but they can take their group of heroes on side quests that involve battling waves of enemies and strategically utilizing each hero’s unique special abilities during real-time combat. Loot collected from these battles is used to upgrade the heroes’ stats, and as the player levels up their account, the heroes themselves can level up further, allowing them to progress against tougher enemy groups. The hero battles taking place in real-time, combined with the need to frequently summon and aim special abilities at crucial moments, stands in stark contrast to my experience with the rest of the game. Because the hero mode is only a side attraction and not the main focus (building a city to compete with others in a multiplayer world), it’s not a completely fleshed-out experience. But I was happy to play it, as it not only gave me an active role in combat (which is something the larger scale battles lacked) but because it didn’t involve me mindlessly upgrading more buildings. No matter what I say this is still a good RPG game and it is worth to try it. So try it!